Our friend and colleague Alfonso Salazar posted the following to his Facebook page: "UFOs OVER MEXICO CITY. This afternoon (December 16, 2015) as of 1 in the afternoon a fleet of approximately 100 unidentified objects was seen from the Mixcoac area. 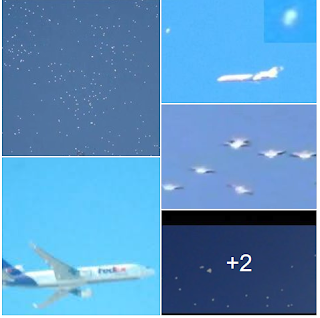 According to Alfonso Flores, these objects were visible over Mexico City from the city's International Airport, where personnel engaged in maintenance duties saw a formation of around 20 object flying in a "V" configuration. This was witnessed by around 30 technicians and airport staff around 3 in the afternoon. Subsequently, at 5:30 in the afternoon, a white spherical object was seen flying from north to south. A Boeing 767 over the Gulf of Mexico flew under this object. As of this time, some 30 witnesses at MCIA saw the object, which gained height as it flew north of the airport."